Adopt policies, especially fiscal, wage and social protection policies, and progressively achieve greater equality. Encourage official development assistance and financial flows, including foreign direct investment, to States where the need is greatest, in particular least developed countries, African countries, small island developing States and landlocked developing countries, in accordance with their national plans and programmes. Inequalities remain persistently stark in the world today. From 1988 and 2008, the wealthiest 5 per cent of people captured 44 per cent of global income, while little changed for the poorest. In developing countries, income inequality rose by 11 per cent between 1990 and 2010. With less income and fewer assets than men, women, particularly single-mother households, are more likely to live below 50 per cent of median income. Evidence suggests that inequality between women and men in a household is a strong contributing factor to overall income inequality in society. Patterns like these are unjust and weaken the social fabric, while also being a source of economic inefficiency and a driver of unsustainable environmental practices. Inequalities across countries often leave poorer countries without the financial resources or trade opportunities, among other factors, to implement policies to achieve gender equality and other forms of inclusion. Within countries, economic and social policies need to be explicitly geared towards reducing gender inequalities. For women and girls, gender inequalities have consequences for income as well as other basics of well-being, such as health and education. Intersections with other types of discrimination, such as those related to age, disability. Ethnicity, migration, economic status and so on, multiply the burden of inequalities many times over. UN Women acts to reduce inequality within and among countries through advocacy for inclusion and equality in all spheres, using laws, policies and public programmes. We use a human rights-based approach in addressing inequalities and discrimination, including by meaningfully involving women’s organizations and other agents of change, and prioritizing the poorest and most excluded women, including migrant and refugee women, and women with disabilities, among others. Olga Berdeu, 50, is a woman with disabilities from Chisinau, the capital of Moldova, who attended UN Women’s "We have abilities, we want possibilities!" initiative, which aims to strengthen the leadership skills of women with disabilities in the Republic of Moldova. She talks about the importance of treating women with disabilities as equal citizens so that they can show their potential in every field of life. Lenche Zdravkin is a legend in the former Yugoslav Republic of Macedonia for her work with the refugees. Her home in Veles is located just across the railway track, which thousands of refugees traversed at the beginning of the refugee influx in 2016, trying to reach a safe haven in Europe. Ms. Zdravkin helped refugees and migrants when they stopped at her house by the railroad, providing food, water, clothes and other necessities. She also visited refugees in the transit centres of Tabanovce and Vinojug, where UN Women supported women and girls through its local partners. As Tajik men migrate for work overseas, a significant proportion abandon their wives and children. A UN Women programme provided livelihood trainings and self-help groups for abandoned wives of Tajik migrant workers. The project has also led to the recognition of abandoned wives and children as a socially vulnerable group in the law, facilitating their access to free legal, economic and psycho-social services. This report analyses asylum for women survivors of gender-based violence in the EU. It provides background on the legal framework applicable to women and girl asylum seekers, including the 1951 Refugee Convention, CEDAW, the Istanbul Convention and the EU acquis. The report then outlines the relevance of gender and gender-based persecution in determining refugee status. 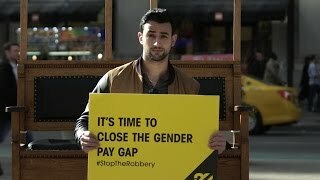 Globally, women only make 77 cents for every dollar earned by men, effectively being “robbed”. This media study is part of UN Women’s EU-funded project, “Promoting and protecting women migrant workers’ labour and human rights: Engaging with international, national human rights mechanisms to enhance accountability”. It focuses on representations of women migrant workers in sending and receiving countries, with an emphasis on women migrant workers from the three case studies of the project: Mexico, Moldova and the Philippines.